If you like your books with a lot of set-up, this isn't the one for you. But if you enjoy being plunked down into the middle of a fully developed and detailed magical world, then you should definitely check it out. In addition to the fun premise and the spot-on, action-packed execution, Nikolas and Company features the classic hero-and-his-misfit-friends. A reader who regularly picks up sci-fi/fantasy books will recognise many of the archetypes, but in a way that seems like welcoming an old friend. Although this first installment is rather short, McGill already begins to establish dimension to his farmiliar characters. Nik and his friends are dissatisfied and outcast -- homesick (Nik), picked on (his brother Tim), refugees (the friends). They are all smart and skilled and are loyal friends, so when faced with the possibility of another world and another time and lots of magic -- they more than willing to put doubt behind them and take the leap. My only minor issue with the book is the ending. 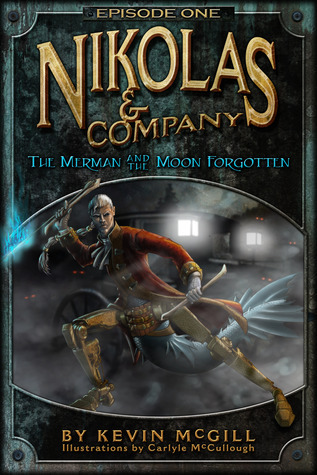 I know the author originally wrote Nikolas and Company as one longer book, then decided to break it up into multiple; and it makes for a jarring ending-that's-not-really-an-ending. The tone of this middle grade to early YA book is similar to the Percy Jackson books, and it's worth checking out or -- if it's not your kind of book -- passing along to your sci-fi/fantasy/adventure reading son/daughter/niece/nephew/student Full disclosure: it was recommended to me by a friend of the author, and I'm glad I took him up on the recommendation. Bottom line: a light, fun and fast-paced read.